Say good morning to your friends and loved ones with good morning messages that will make them smile, feel inspired, loved and happy! Looking instead for romantic good morning love messages? Or check out our good morning wallpaper! 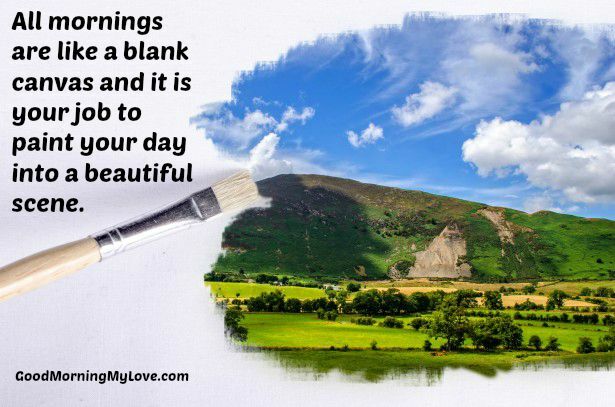 There are so many lovely good morning wishes and quotes out there to choose from and we have searched through all the beautiful, inspirational, funny, cute and sweet good morning messages we could find and created quite a few ourselves. 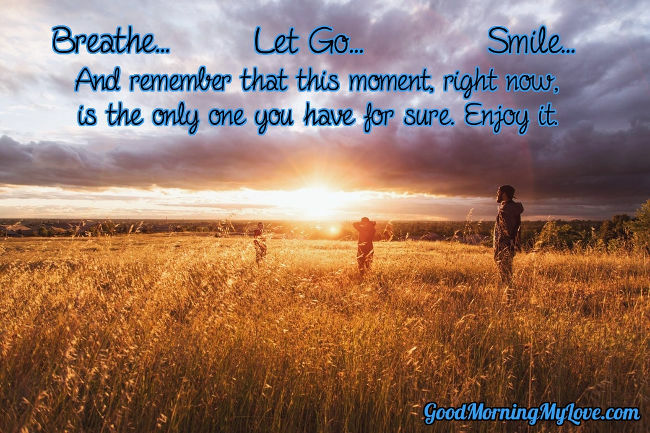 We have carefully chosen and crafted the best good morning quotes, texts, wishes & messages for friends and loved ones and collected them here for you. We hope that these inspirational, funny and cute good morning quotes, wishes, images & messages will brighten your day and do the same for your friends and loved ones. Enjoy and share the love! And remember, some days are tough and no matter how great we feel in the morning, we may not be feeling so wonderful by the end of the day. So, make sure they go to sleep knowing you care about them with good night quotes and good night messages. A picture is worth much more than a thousand words! Use one of these morning images as a good morning message for friends or family and help their day start with a smile and a feeling of warmth in their heart. 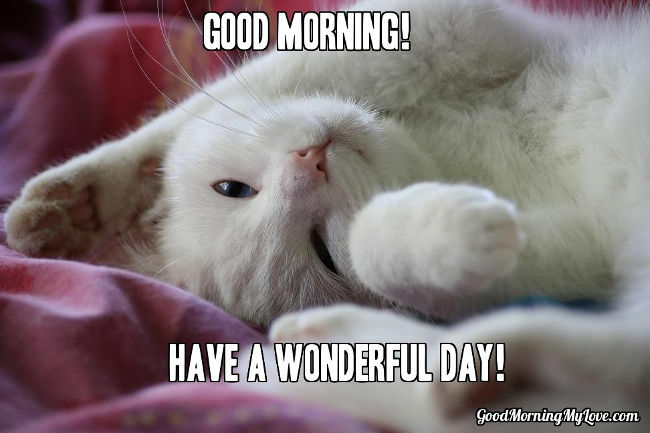 These good morning wishes images are a great way to say “good morning friend”! 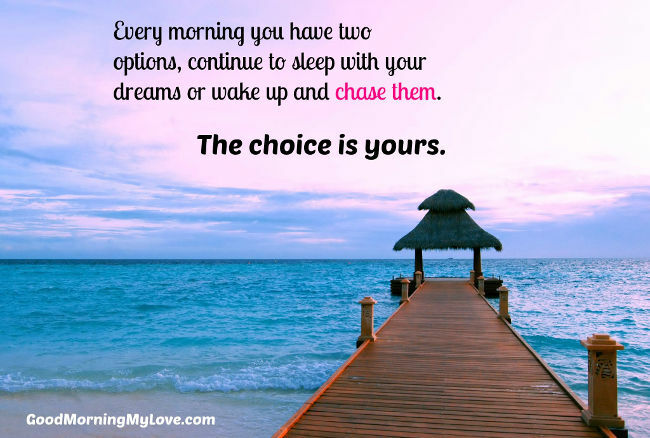 Every morning you have two options, continue to sleep with your dreams or wake up and chase them. The choice is yours. 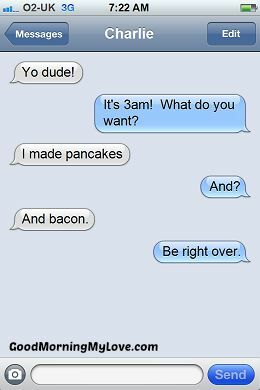 Send these good morning text messages to a friend or those you care about. Feel free to use them yourself or share the image directly. 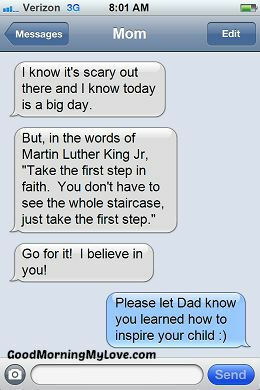 We hope these texts will inspire you with new ideas as well to keep the morning full of joy and love! 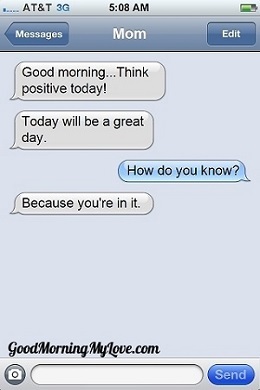 Looking for more good morning sms text messages? 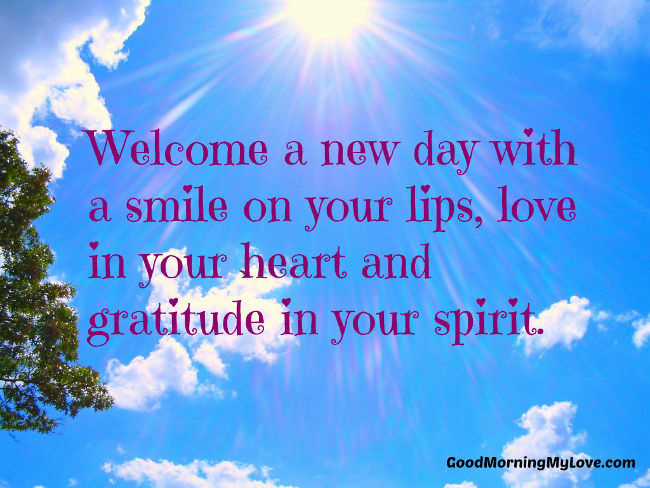 A great way to start the day is with touching or inspirational good morning quotes for friends and loved ones. 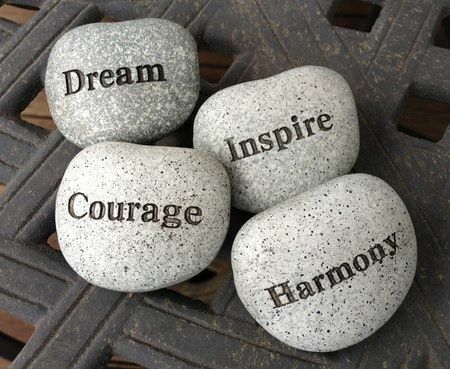 Share the inspiration with those you care about by sending one of these quotes as a good morning message to a friend or loved one. 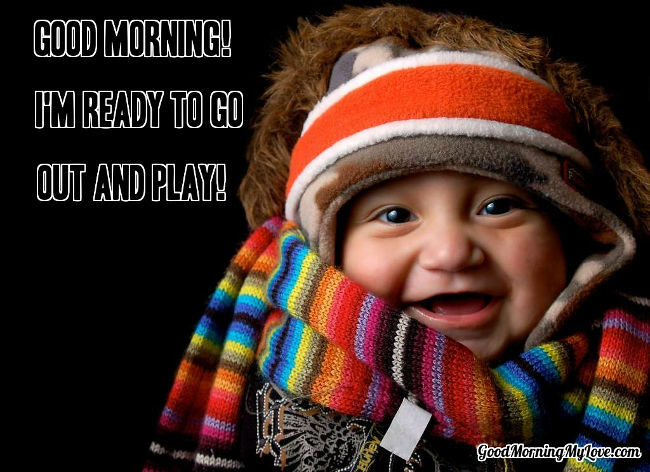 Find the perfect way to say “good morning friends”! Looking for good morning quotes for him or good morning quotes for her? 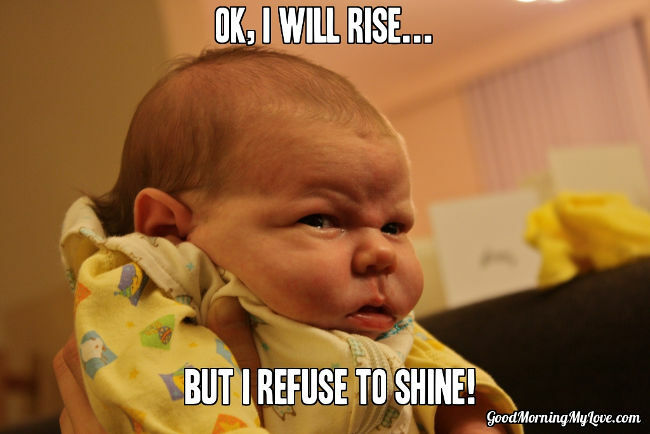 Sending one of these morning memes is a great way to brighten someone’s morning. 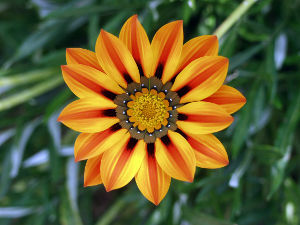 Use these to say “good morning my best friend” or “good morning my beautiful friend”! 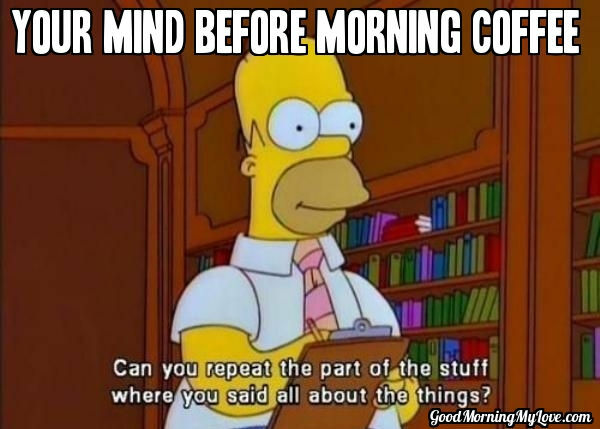 Looking for more good morning memes? What is life without a bit of humor? 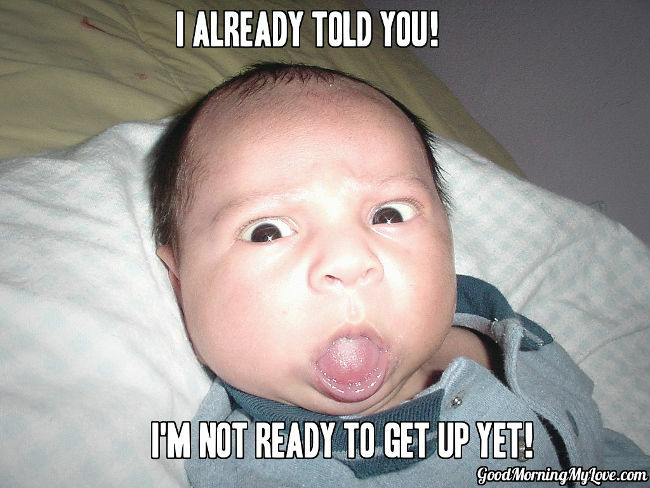 A great way to start the day is with a smile and a laugh. 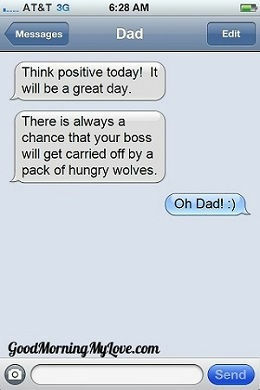 So share these funny morning texts for friends and family with those who deserve to smile. 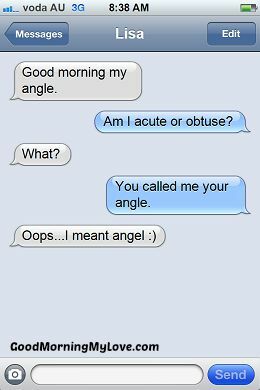 Here are some more silly good morning messages and funny good morning quotes for friends to help start the day with giggles and chuckles! 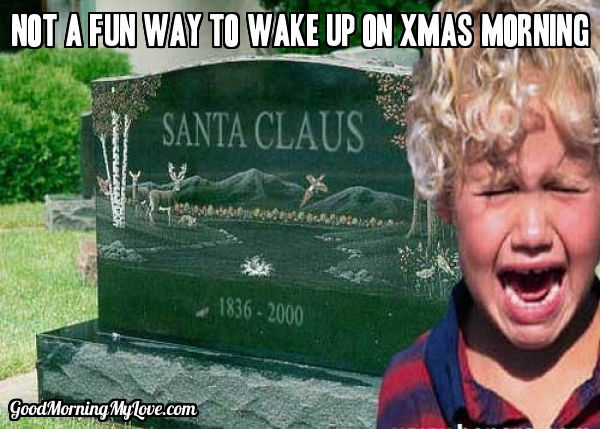 Making them laugh at the start of the day is a great gift for those you care about. 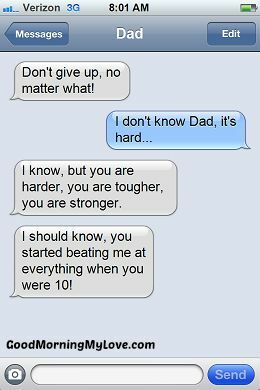 So share with them these funny good morning quotes and messages. 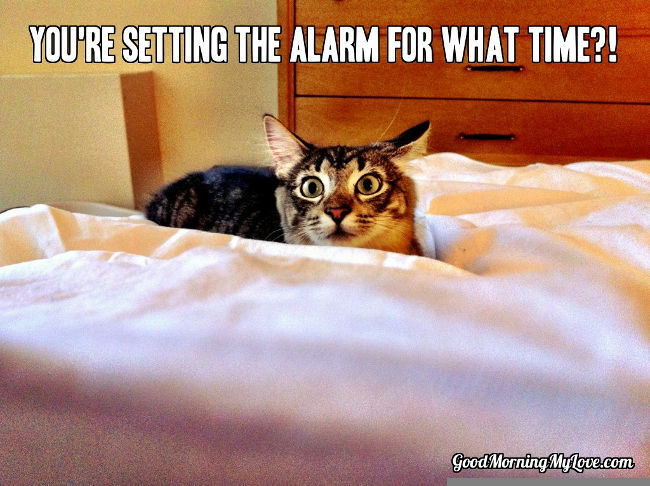 Why is it that when my alarm goes off at 6 am and I close my eyes for 5 minutes, it’s suddenly 7:30. 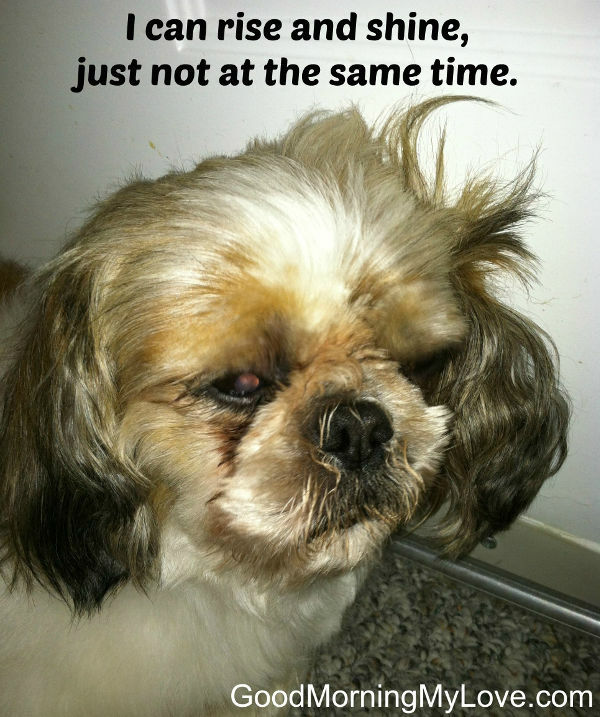 And when it’s 1:30 pm at the office and I close my eyes for 5 minutes, it’s only 1:31? 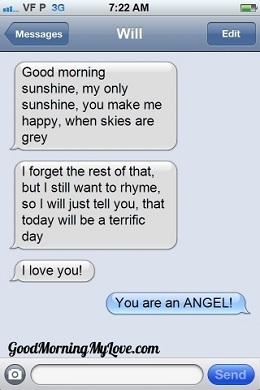 Sending a poem to a friend is a great way to help brighten their morning. If you are lucky enough to have a best friend, then send them the best! Looking for more good morning poems? 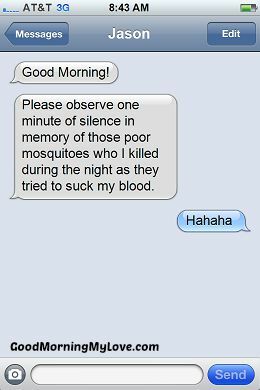 What is the Best Good Morning Message? 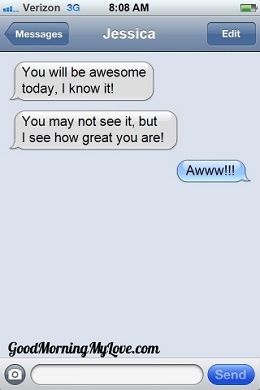 What makes for a really good morning message? 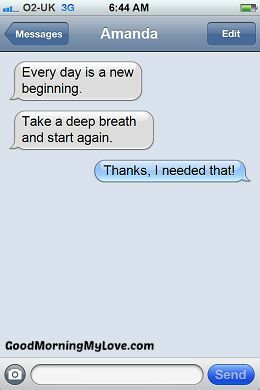 Great morning messages not only help someone to feel good at the start of the day, but they help to set a positive tone for the entire day. 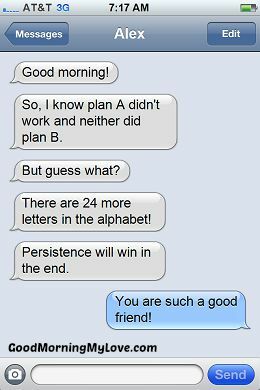 Of course, a message for friends has a very different goal and intended effect than a good morning love message. 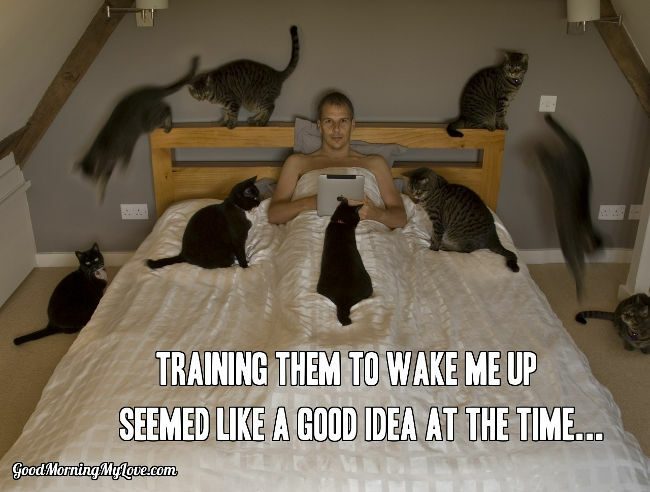 Also effective morning wishes for her will not necessarily be the same as for him. But, in all situations, the best message is the one that is genuine and heartfelt. That is why, here at Good Morning My Love we always recommend that you choose something that puts to words what you already feel in your heart or mind. Sure, it can be hard to put pen to paper and create the perfect morning message so we advise you to simply read through the different morning messages here on this site until you find some that you feel do a good job expressing what you want to say, messages that put to words what is already inside your heart. 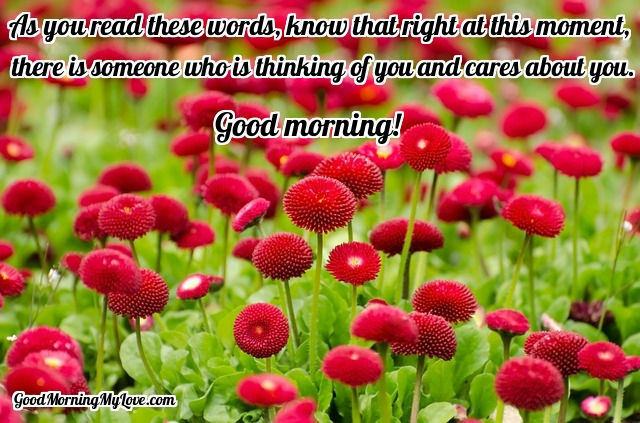 Whether you are looking for a funny, cute, special, romantic or sweet good morning message for her or him or friends or family, the right words will always be right here waiting for you to discover them! 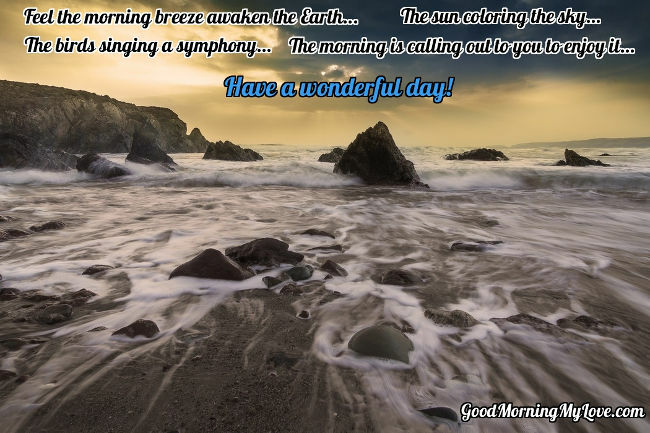 Some days are serious and we need inspirational good morning messages while others days are perfect for a funny good morning message or good morning images for friends. We sincerely hope you found much inspiration, love and enjoyment from these good morning quotes, images, wishes and messages for friends and love ones. 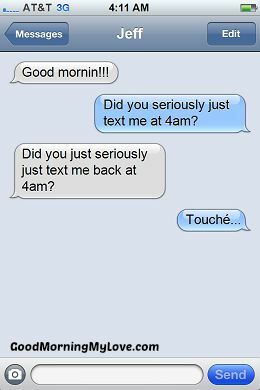 If it is early in the morning and you are away from those you care about and want to help them start the day off right then good morning text messages can help to inspire them or touch their heart. 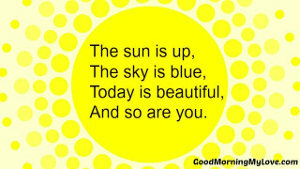 If you want to share some romantic morning quotes & messages then check out our romantic section. 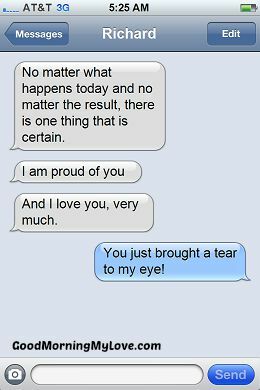 There you will find all sorts of beautiful and heartfelt morning words for your partner. We hope you will agree that this collection contains the best morning greetings, wishes, quotes & messages around!